Most of the machines we sell are designed for in-line use, with a smaller number used off-line. In either case, please ensure your machine is positioned correctly. The floor locks must be used to stabilize the equipment. They can also be used for levelling to cover any slight variations in floor height. The material to be cut should be fed into the cutter from a similar operating height as the extrusion line. For flexible material the caterpillar infeeder/puller belts should be as close as possible to the inlet cutter guide bush. If there is any distance between the exit from the belts & the inlet into the cutter guide then the material might jam or snag. For best results use a combination cutter/infeeder rather than two separate machines. For rigid materials a small gap is recommended between the exit of the infeeder/puller belts & the inlet cutter guide. This allow the extrudate to flex on cut. This can help achieve a square cut end. It is not recommended that the material be pulled off the floor. 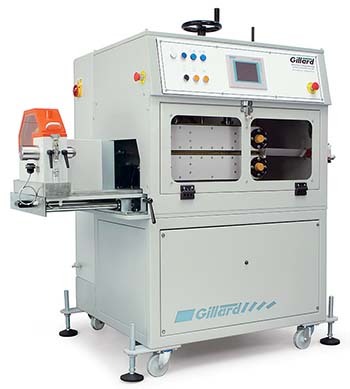 For very flexible extrusions, which are easily stretched, it is strongly recommended that a relaxing loop of material is allowed to form before the cutter infeeder. This will ensure that the extrudate is not stretched as it enters the infeeder belts. It is also important to ensure that any pre-coiled material is allowed to un-twist before it goes into the cutter. A un-wind table or stand should be used to remove any twist. For more advice please email our Technical Team: tech@gillardcutting.com.